2018 May 17th at 21h 27m UT, the Moon and Venus over Knitchin Hill, Rousay. A composite image: Nikkor 135mm f/2.8 and Nikkor 400mm f/5.6; D300 SLR (average exposure 1/200 sec f4.5). 2018 ‎February 23: Occultation of bright star, Aldebaran, by the Moon. 23 ‎February ‎2018, ‏‎17h 52m16s. 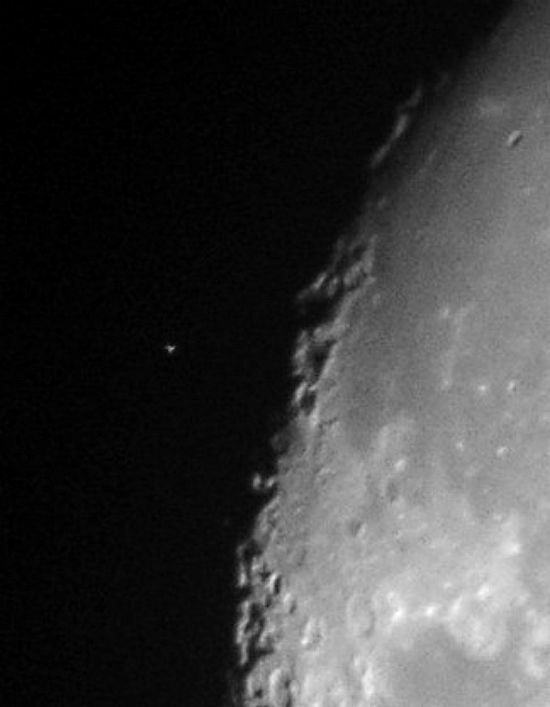 Aldebaran 2min. 12 sec. from reappearance. ‎Exposure: 1/400 second. 100mm f/9 apochromatic refracting telescope.Photo: John Vetterlein. The first observation with the 100 mm achromatic telescope using a power of 45x was made at 07h 42m on January 5th. Skies had been mostly cloudy over the previous six hours the Moon having just emerged form a puckered sky into a region a clear, twilit sky with cumulus rolling up from the NNE. Things looked promising! But within a few minutes cloud resumed and the remaining observations up to the time of first contact (08h 10m 31s) were made through cloud of varying opacity. Despite the conditions, some 35 images were secured using a Dimage F200 digital camera working at ISO 400 with speeds of 1/100 to 1/350 second most of which showed Regulus quite well. Cloud then thickened making it impossible to observe the reappearance of Regulus at approximately 09h 05m 45s. Provocatively conditions then improved considerably for around ten minutes. January 05 at 05h 08m 10s12. A 1/365 sec. exposure ISO 400. 100mm f/9 achromatic refractor power 45x. 2017 December 31: Occultation of Aldebaran (alpha Tauri, mean visual mag. 0.75). 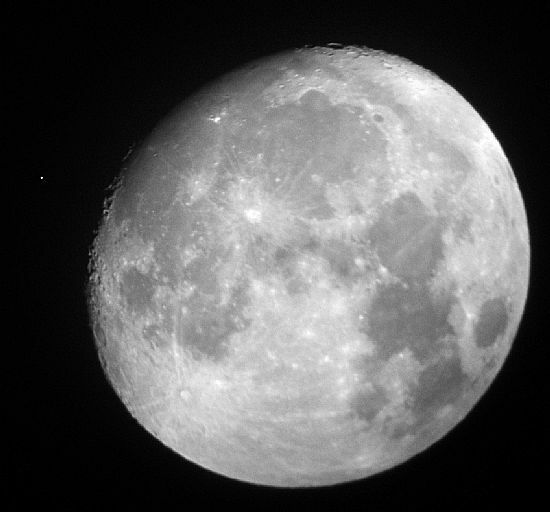 The Moon and Aldebaran had been imaged with a 135mm focal length lens the previous evening and night; conditions were then reasonable with some hope of a clear sky for the occultation within the hour after midnight. The first observation with the 100 mm achromatic telescope using a power of 45x was made at 00h 50m on December 31st. (The use of a Nikon 500mm f/4 lens with D300 camera had to be abandoned due to the vagaries of the weather threatening rain at any moment.) Aldebaran gave a steady image (altitude 38°) despite passing cloud, some light but varying a good deal and sometimes threatening to extinguish the view. The star was then 3' 22" from the Moons dark limb. 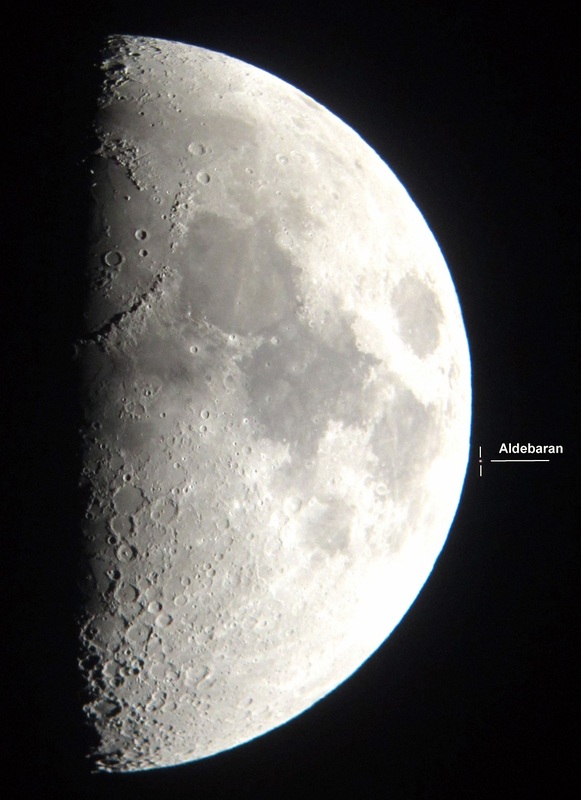 The apparent lunar movement relative to Aldebaran was then close to 2 arc-seconds per second of time. 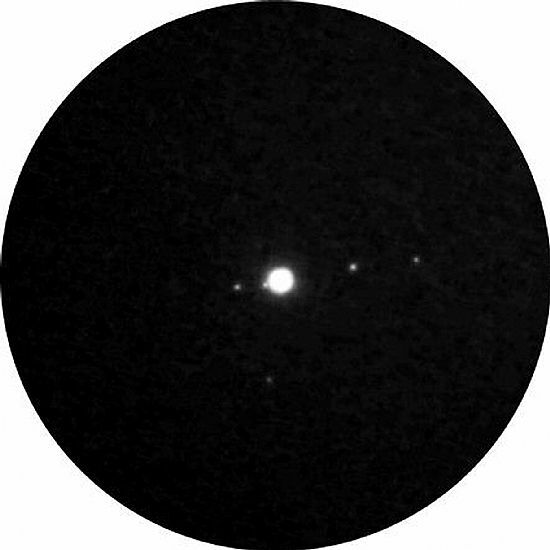 A number of images were obtained through the eyepiece of the telescope up to first contact timed at 00h 56m 41s (accuracy ±1 second of time). We give a full disc image showing Aldebaran (left) 3' 20" from the Moon's dark limb at 00h 50mm 10s and an enlarged section of the Moon's limb within 2 seconds of first contact at 00h 56m 39s. We were not able to observe the emergence of Aldebaran approximately one hour later owing to dense cloud. 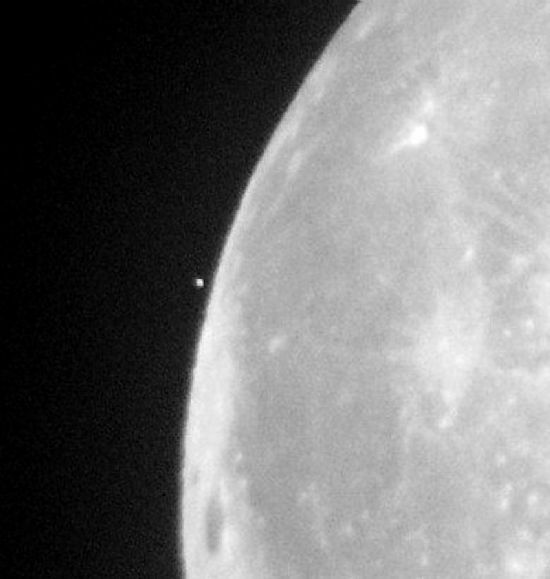 The Moon's apparent diameter at this occultation was 2013.78". (Distance: 359996 km light time: 1.2s). Aldebaran (alpha Tau) Apparent diameter 0.020" approx. (red giant star). (Distance or light time: 65 years. 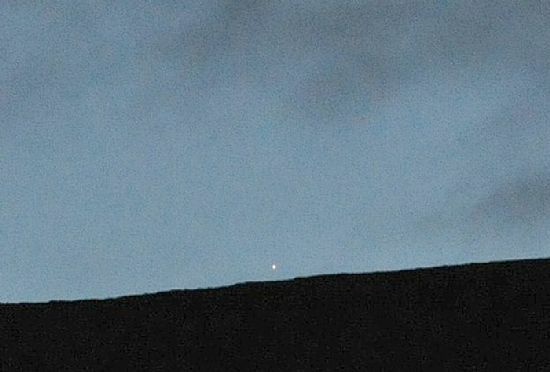 At this distance the light source from Aldebaran, as viewed from Earth, is to all intents and purposes a point without perceptible surface area. The occultation if viewed from above the Earth's atmosphere would give an immediate cut-off for the star at the Moons Occulting limb. (i.e. no fading as with a planet.) However the light from the star is subjected to distortion in the atmosphere resulting in as tangible "cylinder" of light and so there is as very small, perceptible fading at "contact". 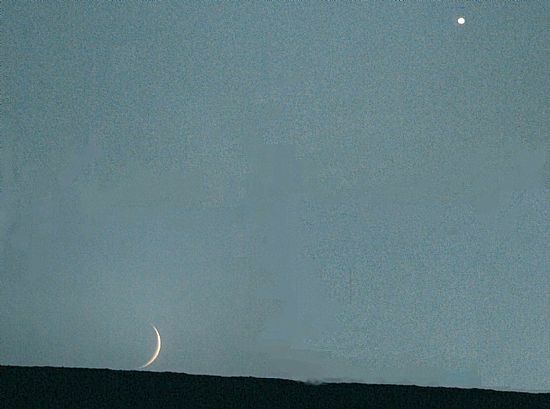 This is shown in the image as a blurring of the stars image close to the Moons limb. To the human eye, the light is sensible an instantaneous cut-off. The large crater at the lunar terminator is Hevelius, diameter 109 km. 2017 August 26: "Vermin of the Skies". Neptune imaged with Tokina 300mm f/2.8 and Nikon D300 SLR. dia inner circle 30 arc-min approx. (Neptune at centre). Altitude of Neptune 15° 37'. 2017 May 14: Jupiter Update. 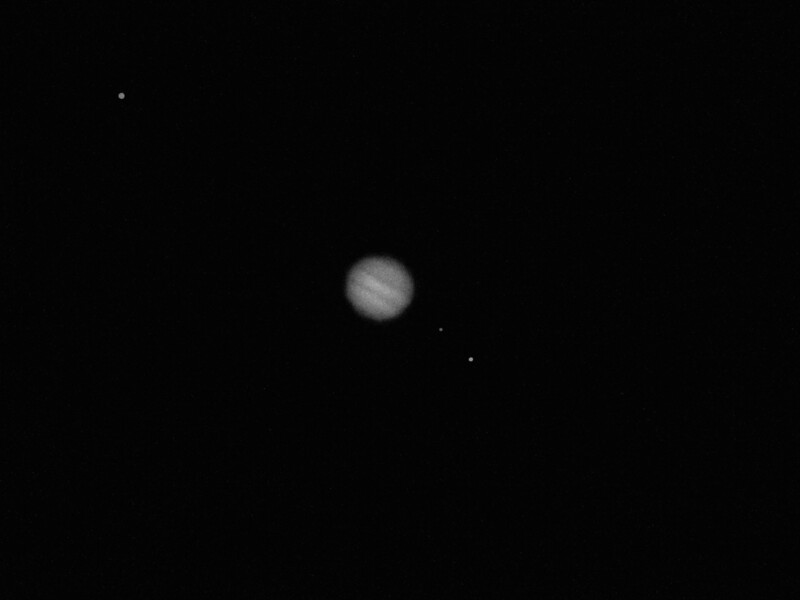 Two images of Jupiter secured with a 300mm f/4.5 Nikkor lens attached to a D300 SLR mounted on an ordinary camera tripod (static camera). The exposures were: 4 seconds and 1/10th second respectively. The first image (21h 25m) was in strong twilight and grossly overexposed requiring much processing. However, it gave in the end a superior image to faster exposures up to 1/30th second taken at this time. 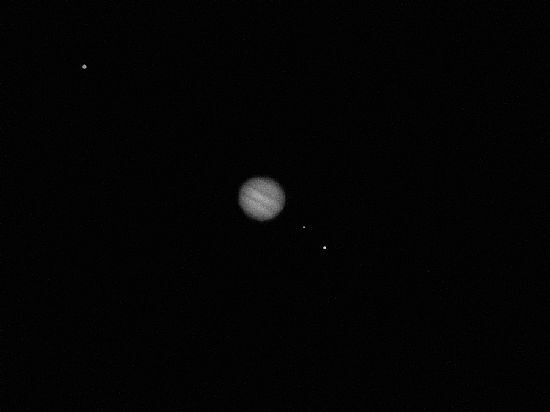 The second image (22h 53m) required little processing, with Jupiter in a somewhat darker sky. The star below in constellation Virgo is TYC 4953-1224-1, mag. 6.45. This small change in position relative to the star is measurable on the original images. The order of satellites is (L to R) Europa, Io, Ganymede and Callisto. Jupiter Update: 2017 April 21. The two images were secured 42 minutes apart, demonstrating the clear movement of Ganymede in towards Jupiter, a transit of the planet commencing at 01h 08m UT the following morning. 2017 April 21 21h 32m UT, Nikkor 300mm f/4.5 stopped down to f/18; D300 SLR ISO 2000. 1 sec. exposure. Satellites (from L to R): Callisto, Io, Ganymede and Europa. Note: Over-exposure on Jupiter. In the 120mm refractor at 220x the transit could be timed to within a few seconds. 2017 April 21 22 h 13m UT Nikkor 300mm f/4.5 stopped down to f/18; D300 SLR ISO 2000. 1 sec. exposure. Static camera for both of the above. Images were also secured with the 100mm refractor. 100mm apochromatic refractor (F/9) 120x; D300 SLR, ISO 2000. 1 sec. exposure. All images cropped and inverted. 2017 April 12th: Jupiter Five Days Past Opposition. 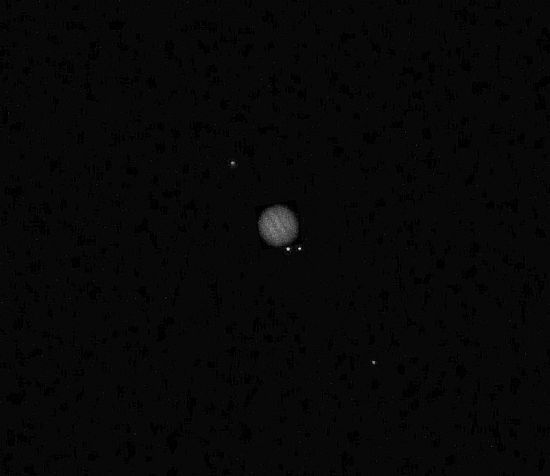 Jupiter 2017 April 12 at 21h 55mm UT. 100mm apochromatic refractor 160x: Canon IXUS DC, 1/20 sec. ISO 1200. Satellites (from L to R): Callisto, Europa, Ganymede, (Io in eclipse by Jupiter). 2017 April 06: Juiter just past opposition (April 07). Star at left of field is theta Virginis: visual magnitude: 4.38 Spectral class: A1V. Very poor sky transparency. Moon phase 94.5%, separation from Jupiter 42° 20'. Planet Mercury in the Evening Sky: Early April. 2017 April 03, 19h 49m. Mercury (mag. 0.4) about to disappear behind the shoulder of Knitchin Hill as seen from Springfield. Altitude: 8° 59', Azimuth: 284° 38'. Mercury time of true setting 21h 9.9m. Nikkor 135mm f/3.5 D300 SLR 1/20 sec. ISO 2000. Mercury is fading at a remarkable rate, as shown in the following table. Super Moon November 14th 2016. 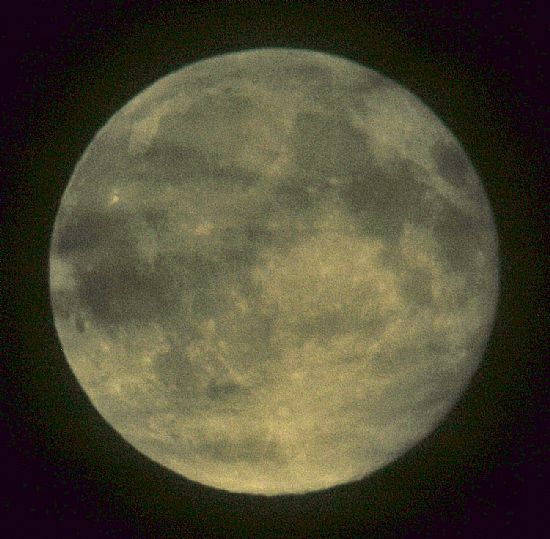 The term Super Moon refers to a full Moon coinciding with, or close to, perigee (see feature PDF). The full Moon of October 16th 2016 took place with the Moon at a distance of 358472.5 Km, the full Moon on.9 November 14 will be at a distance from Earth of 356520.5 Km. The difference of 1952.0 Km, with the Moon closer to Earth on the 14th November, results in a difference in apparent diameter of 12.63 arc-seconds, hardly noticeable to the unaided eye. Therefore, those who were fortunate enough to observe the Moon on 16th October would have been treated to a near perfect so-called super Moon! Go to the PDF version: Super Moon for full details. Whatever happened to the Strawberry Moon? The term “Strawberry Moon” refers in general to a full Moon occurring close to the summer solstice each year, generally in June but sometimes in July. 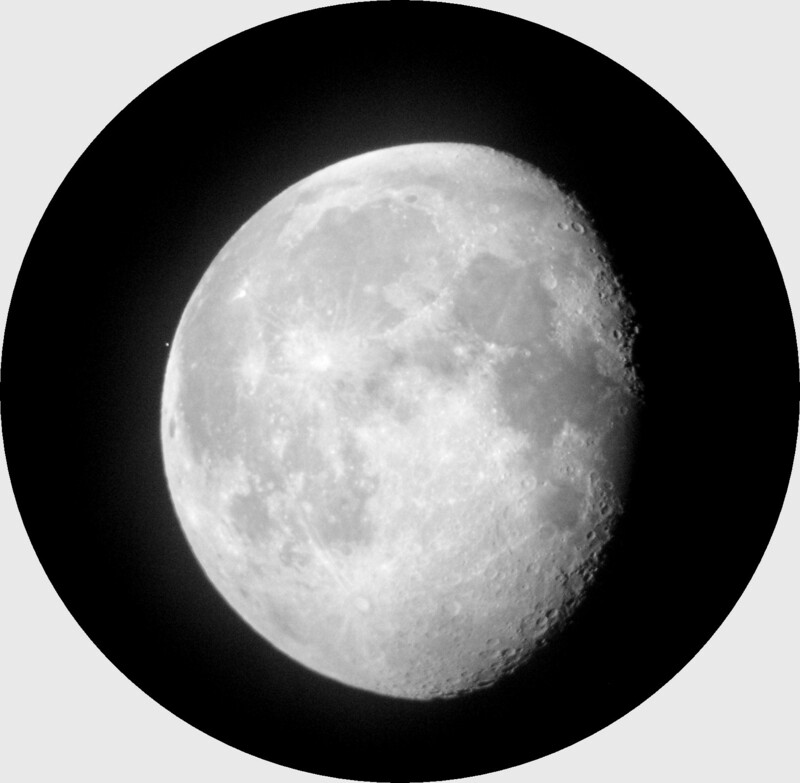 The appearance of the Moon, as always, will depend upon atmospheric conditions at the time of observation. The summer solstice in 2016 took place on June 20th at 22h 33m UT. Full Moon this month was on 20th June at 11h 02m UT with the Moon below the horizon as seen from Orkney. The two events were therefore separated in time by 11h 31m. The fact that this happened on the same date is interesting but hardly of visual interest to the casual observer. Further, the title “strawberry moon” is of astrological interest rather more than an astronomical phenomenon. The Moon was situated in constellation Sagittarius, nearly 4° north of the ecliptic thereby depriving it of true full Moon status; this may be verified by the appearance of shadowed crater walls on the southern limb. Of astronomical significance will be a fine “Super Moon” on November 14th 2016 when full Moon occurs close to perigee, or closest approach to Earth. This we hope to feature in an article for the paper edition of The Orcadian in early November. The Moon (altitude 8.4°) imaged in cloud June 20th at 22h 58m UT. 100mm achromatic refractor at magnification 45x; Minolta F200 digital camera. For Equinox & Solstice, go to: BASICS page. When I first came to Orkney in 1970 it was possible from Rousay on a dark, clear night at an appropriate time of year, to see the Milky Way from horizon to horizon. Today, ground light sources from a massive expansion in housing and industry—street lighting, illuminated fish cages, so-called marine renewables and so forth, now make that impossible. The above factors not withstanding, full darkness at night is lost at our latitude during the months from May to August inclusive due to twilight. This means that we miss out on a number of spectacular star groupings (constellations) associated with the night sky during these months. A good example of this is the zodiacal constellation, Scorpius, one of the most impressive groupings in the entire sky. Generally speaking, the best time to observe stars, planets (excepting Mercury and Venus) and the Moon is when they are at their maximum altitude above the horizon, in other words when they are on or close to the southern meridian around true midnight. 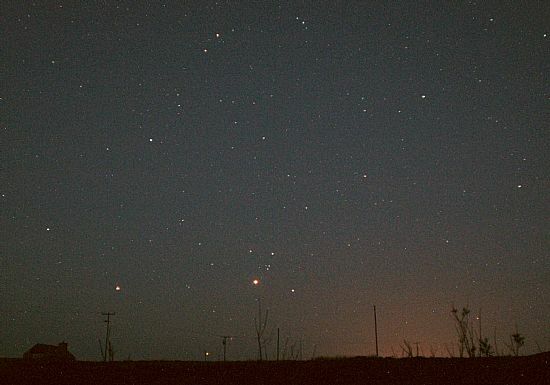 Returning to Scorpius, with its brightest, red super-giant star Antares (Rival of Mars); this star is due south at midnight on the 1st of June. But twilight is at is strongest here in Orkney during the months of June and early July. Not only that, but only part of the constellation is visible from Orkney, with Antares having a maximum altitude of only +4.6°. So, when may Scorpius best be seen from Orkney? The fact is, Scorpius may never be seen from our latitude in a dark sky. The best we can manage is to look for Antares from around mid-January to early February in the early hours before sunrise. For example, on January 20th Antares rises at 06h 20m, becoming due south at 08h 42m, coincidental with sunrise! It so happens this year, 2016, that Scorpius is host to Mars at its closest to Earth, namely about the time of opposition (opposite in the sky to the position of the Sun) occurring on May 22nd. 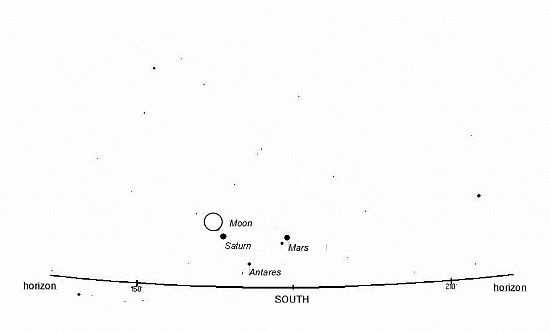 The diagram gives the sky looking due south close to midnight featuring, additionally, both Saturn (opposition June 3rd) and a near-full Moon (considerably exaggerated in size). The sky looking due south close to midnight featuring, additionally, both Saturn (opposition June 3rd) and a near-full Moon (considerably exaggerated in size). 2016 May12 at 00h 03m. 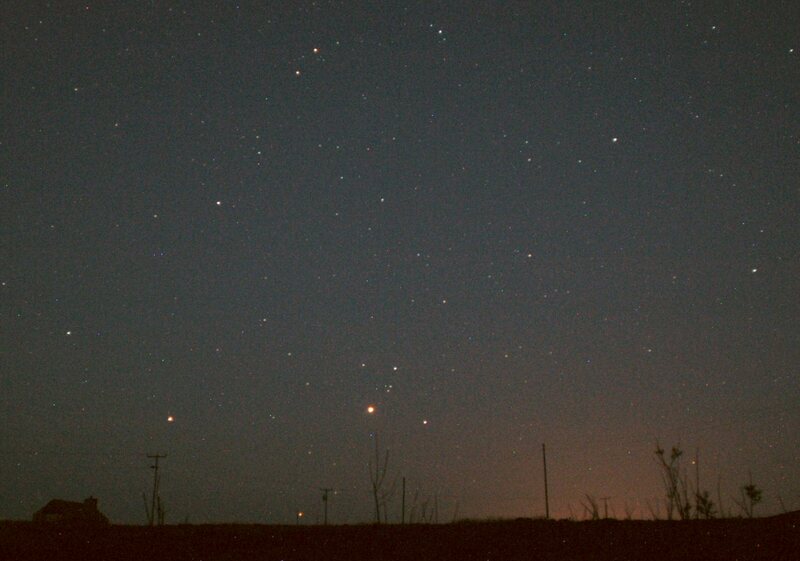 Looking a little east of due south showing from left to right (E to W) Saturn, Antares (low down) and Mars. Nikkor 24mm f/2.8 D100 SLR a 15 sec. exposure (static camera). Note: Light pollution from sodium vapour lamps (Kirkwall & Rousay jetty regions). An array of “hydro” poles too! Some sixty vertical structures to do with electricity systems (including wind turbines) are within sight of the observatory here on Rousay.